WASHINGTON (AP) — Former city and federal officials pointed fingers at one another for failing to protect the 100,000 citizens of Flint, Michigan, from lead-laced water at a congressional hearing Tuesday as Republicans targeted for blame an Environmental Protection Agency executive who resigned as the crisis worsened. Amid withering criticism, Susan Hedman sought to defend the EPA's actions to deal with the contamination in the predominantly African-American city. "I don't think anyone at EPA did anything wrong, but I do believe we could have done more," said Hedman, the former director of the EPA's Midwest regional office. 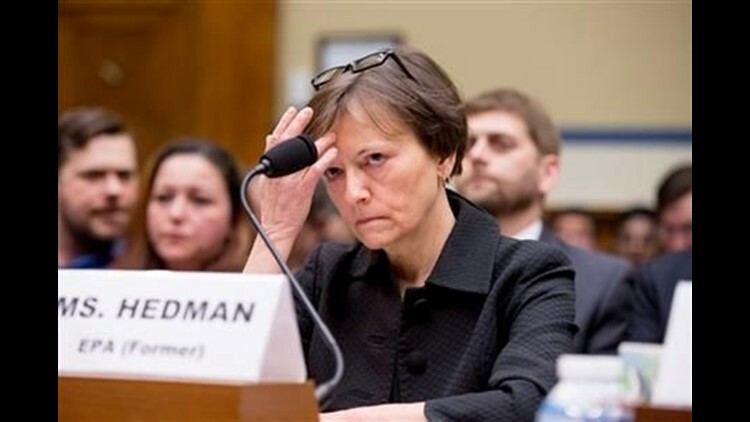 Hedman stepped down Feb. 1 over what she called "false allegations" that portrayed her as sitting on the sidelines during the crisis and that she "downplayed concerns raised by an EPA scientist about lead in the water." The scientist Hedman was referring to is Miguel Del Toral, a regulations manager in the groundwater and drinking water branch of the Midwest office. Rep. Jason Chaffetz, R-Utah, chairman of the House Oversight and Government Reform Committee, said Hedman "dismissed" Del Toral's warnings. "You screwed up and you ruined people's lives," Chaffetz told Hedman. Flint switched its water source from Detroit's water system to the Flint River in 2014 to save money, but the river water was not treated properly and lead from aging pipes leached into Flint homes and businesses. Elevated levels of lead have been found in children's blood. Lead contamination has been linked to learning disabilities and other problems. Virginia Tech professor Marc Edwards, who helped expose the lead problem in Flint's water and is now assisting both the city and state, accused Hedman and the EPA of "willful blindness" and for being unrepentant and unremorseful in the aftermath of the crisis. The committee's top Democrat, Rep. Elijah Cummings of Maryland, said he agreed the EPA could have done more. But Cummings said state authorities in Michigan also failed to act. The committee released several internal EPA emails, including a Sept. 22 message from Del Toral to his supervisors that outlined his frustration with what he called the agency's "denial and delay" approach in Flint. "At every stage of this process, it seems that we spend more time trying to maintain state/local relationships than we do trying to protect the children," Del Toral wrote. The EPA responded within the "cooperative federalism framework" of the Safe Drinking Water Act, Hedman testified, which assigns states the legal authority to implement drinking water regulations. She said the EPA's enforcement options under the law are more constrained than in other federal environmental statutes. The state-appointed emergency manager who oversaw the city when its water source was switched to the Flint River said he was "grossly misled" by state and federal experts who never told him that lead was leaching into the city's water supply. Earley told the committee that he and other Flint leaders "were all totally dependent" on analysis and expertise provided by state and federal officials. For months after the April 2014 switch he believed information he was receiving — parts of it scientifically complex — was accurate, Earley told the committee. But Earley said in hindsight he should have done more to challenge the experts who told him Flint's water problems were harmless to human health and geographically limited in nature. Former Flint Mayor Dayne Walling blamed the crisis on the state of Michigan's focus on balancing the city's books and "choosing low cost over human consequences." Walling also faulted the state's emergency manager law, which placed Flint effectively under state control since November 2011. The law "takes away the natural checks and balances" of democratic government and "minimizes the voices of the citizens by placing control so far away from the community," Walling said. Earley took over as emergency manager in Flint in October 2013 — seven months after the Flint City Council approved the water switch and former emergency manager Edward Kurtz signed it.